Sketches of Canada for January 15th! January 15, 1892 – James Naismith, from Almonte, Ontario, first publishes his ‘Rules of Basketball’. 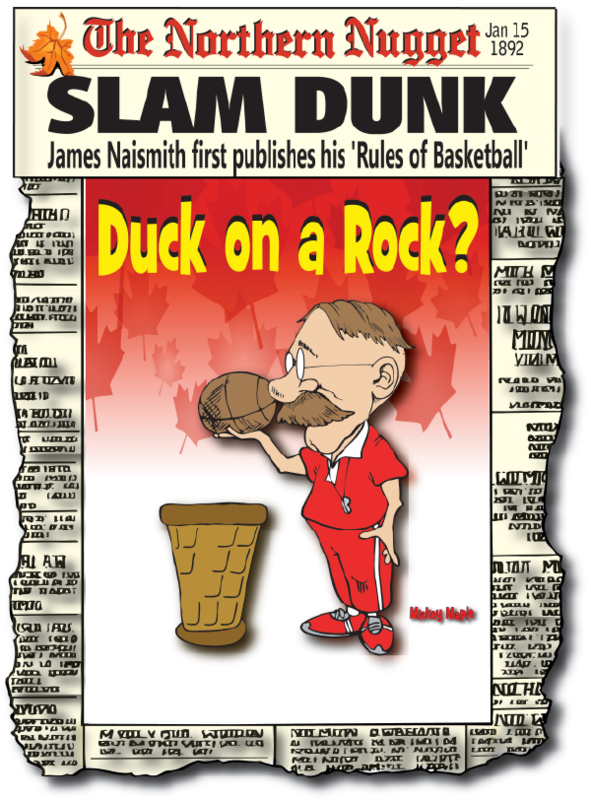 This Canadian History for Kids exclusive, looks at James Naismith and game that was inspired by his childhood pastime, ‘Duck on a Rock’. James Naismith was born in Ramsay township, near Almonte, Ontario, Canada and attended McGill University in Montreal, Quebec. After serving as McGill’s Athletic Director, Naismith moved on to work at the YMCA Training School in Springfield, Massachusetts, in 1891. In 1891, while working as a physical education teacher at the school, Naismith was asked to develop a game that would not take up much room, was not too rough and could be played indoors. He was inspired by a game he played as a child in Canada called “Duck on a Rock.” In this game, players throw a small rock at a “duck” placed on top of a large rock in an attempt to knock the “duck” off. The first game was played on December 15th, 1891. The first game had a peach basket nailed to either end of the school’s gymnasium, and had two teams of nine players. The ball that they used was a soccer ball. Canadian History for Kids has learned the original rules did not include what is known today as the dribble, and only allowed the ball to be moved up or down the court via passes between players. It was on January 15th, 1892, the rules to the game were published in the Springfield, Massachusetts school newspaper, The Triangle. The Naismith Memorial Basketball Hall of Fame in Springfield, Massachusetts, is named in his honour, and he was an inaugural inductee in 1959. The National Collegiate Athletic Association rewards its best players and coaches annually with the Naismith Awards..
Naismith was also inducted into the Canadian Basketball Hall of Fame, the Canadian Olympic Hall of Fame, the Canadian Sports Hall of Fame, and the Ontario Sports Legends Hall of Fame. Basketball is played by more than 300 million people worldwide, making it one of the most popular team sports in the world.